School is keeping me pretty busy right now, but it's going on hold for a second because I've had a special request for another blog post. This one's for you, Dad (and anyone else who's interested). My parents went to Italy last May and with two of my mom's good friends from college. When asked about their experience when they came home, my dad's go-to line was, "I loved being able to eat without fear." Of course he loved other things too, but the food was definitely a highlight. The same is true for Belgium. I kind of excepted the food to be less than satisfactory for some reason. I guess I thought not eating Chic-fil-A and Mexican food for a semester would be borderline torturous. Thankfully, I was wrong because Belgians are really good at food. You've got the specialty items: chocolate, waffles and frittes (fries). They are well known for a reason. They rock. I eat chocolate nearly everyday. It never gets old since there are so many varieties. Even the chocolate in the vending machines on campus is gourmet. I'll try not to be obnoxious about it when I come home, but I don't think Hershey's is going to cut it anymore. If you're familiar with Parks and Rec, you know how much Leslie Knope loves waffles. 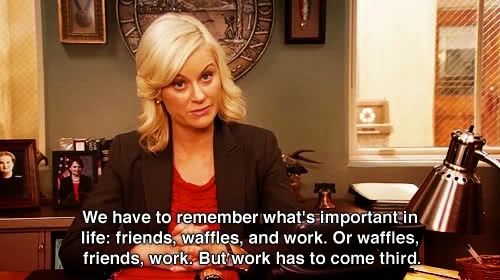 Well, I like everything about Leslie Knope and I also like everything about waffles. I'm convinced she would love Brussels (if she wasn't a fictional character). There are two types of waffles here. Brussels waffles and Liege waffles. Liege waffles are easier to find because they're sold from waffle trucks on the street. Your options are chocolate sauce and whipped cream. I've tried both (obviously) and I'm a big fan of each. Brussels waffles are much lighter. They kind of taste like funnel cake- but you feel far less fat and disgusting after you eat one. So that's a plus! Frittes. Holy cow. So good. I crave frittes on a daily basis. French fries are actually a Belgian creation, not a French one. French refers to the way the potatoes are cut, so that's where the confusion comes from. Belgians are very proud of their frittes, as they should be. Frittes are made fresh to order, served in a paper cone and drenched in sauce. Most people choose mayo, but samurai sauce (basically just a spicy mayo) is also excellent. Final thoughts: I've enjoyed all of the other food I've had here too, (especially at the 11 course Belgian food tasting) but I won't bore you with those details. Although I look forward to devouring some chicken minis and chips and queso in a few months, I'm loving the food here. So here's to eating without fear. Bon appetit, my friends! We very much appreciate this, and look forward to your next installment for Ron Swanson on Belgian meats!